Hi, this is Angelo, thanks for visiting my website. 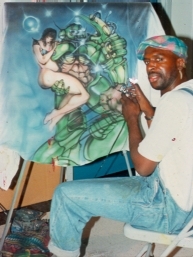 I have been an airbrush artist for over 25 years and I am based in the Baltimore-Washington D.C. area. I do a lot of work for various clients and small business. I can airbrush just about any surface and I can work from any photograph with accurate detail. All work is "made-to-order" at prices that are affordable for everyone. Right now I am working on a new original collection of scifi and fantasy airbrush artwork for consumers. Please take a moment to look at my various sample airbrush artwork. Also, you can check out both the business and consumer art work sample galleries as well ! I am sure you will not be disappointed. If you have any questions or comments, just click on the @ symbol or the guestbook below. Once again, thanks!